Is the Razer Cynosa Chroma supported by Synapse 3? How many lighting zones does the Razer Cynosa Chroma has? The Razer Cynosa Chroma is individually backlit and comes with a total of 104 LEDs found under each key for full customization. Is the Razer Cynosa Chroma water resistant? What type of switch does the Razer Cynosa Chroma use? How do I customize the Razer Cynosa Chroma backlighting? The Razer Cynosa Chroma backlighting are fully customizable using Chroma Studio on Synapse 3 device configurator software. Chroma Studio offers 16.8 million color options and multiple lighting effects to choose from, allowing you to mix and match your keyboard lighting just the way you want it. Can I turn off the Razer Triple Headed Snake Logo that is at the bottom of the Razer Cynosa Chroma? Can I program the "FN" key on my Razer Cynosa Chroma? How do I remove the key from my Razer Cynosa Chroma? Razer does not recommend removing the keys from the Razer Cynosa Chroma. Excessive force can damage the key itself. If you desire to clean under the key, Razer suggests holding the unit upside down and/or using compressed air from a can. Do I need software drivers to use the Razer Cynosa Chroma? You may use the standard keyboard functions by simply plugging the Razer Cynosa Chroma to any available USB port on your computer. However, you will need to download the software and drivers in order to enable advanced features such as macro recording and profile settings. Does the Razer Cynosa Chroma have anti-ghosting capability? How about N-key rollover? 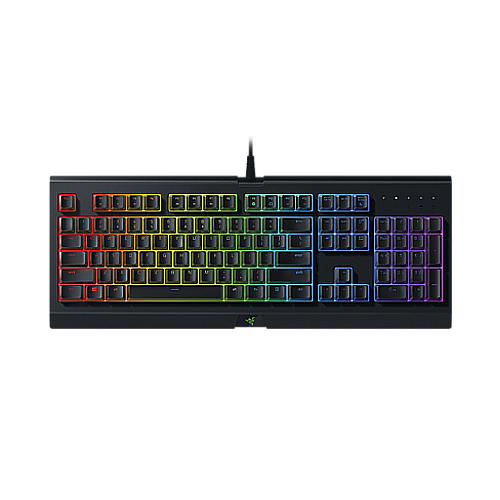 Yes, the Razer Cynosa Chroma features a gaming optimized key matrix that allows the recognition of up to six(6) simultaneous key presses. N-key rollover (NKRO) only works with a direct connection to a native PS/2 port on the computer which provides for other limitations that USB overcomes. The Razer Cynosa Chroma's gaming optimized key matrix serves a similar purpose while using an ordinary USB port.